Package includes one prescription adapter and four different lens. Neutral Gray: Provides true color definition. Ideal for everyday, all-purpose wear. Blue: 9% Transmission. Nuetral Transmission. Extremely Bright Light. 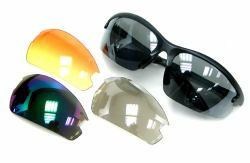 Clear MLC: Clear lens with a special multi-layer coating. Enhances visual acuity during low-light conditions. Cadmium Yellow: High contrast yellow lens. Ideal for very low light conditions.